Precise Machine Company, specializes in the high precision CNC machining of electronic and medical PCB enclosures, heat sinks, aluminum castings and forgings. We also specialize in the close tolerance CNC machining of thin walled parts, motors, pumps and generator housings, as well as, end bells and electrical connectors. We have the experience, expertise and capability to provide turn-key mechanical assembly solutions for your manufacturing needs. 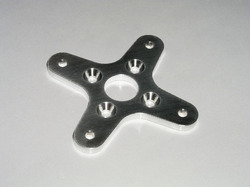 CNC machined aluminum X mount designed to fit most motors utilizing a 30 x 30mm bolt spacing. These X -mounts are machined from a solid piece of aluminum T6061 are stronger than the original cast or stamped aluminum mounts that typically come with the motors. This new design also adds extra material around the countersunk holes where the motor attaches. An area known for cracking. Precision Metal Works is committed to produce and quality products to meet customers requirements like Pneumatic Fittings and Accessories by continually improving its Quality Management System. These are based on latest technology, and are widely demanded for their assured quality, reliability and durability. These pneumatic fittings are used across various industries and applications and are offered in attractive finishes, precision designs and in custom specification. 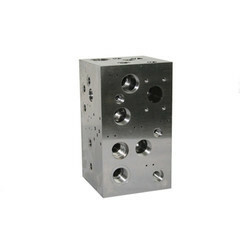 We are one of the largest manufacturers and exporters of all typess of Aluminum milled parts CNC milled components turned parts Milled manifolds for hydraulics, fastening, electrical , Automotive, HVAC, Pneumatic industries. We have CNC milling machines which helps us in cnc mill, bore, thread vertically as well as horizontally on Aluminum bars. At PMW we specialize in high-end cnc milling for a variety of different industries, including military, defense, aerospace, bioscience, mining, and recreational. Iron: grey iron and ductile iron6. Aluminum: 6061, 6063,7075,5052 etc. Precision Metal Works founded 30 years ago is service provider of CNC Milling & Turning Job Works using latest CNC technology to perform our tasks in a flawless manner. We provide labor Job works for our esteemed clients and are engaged in machining on all type of metals. Type of services offered: CNC lathe, CNC Milling, CNC labor job, CNC machining job, CNC turning job works. Raw Materials:As per customer specified requirements we can provide material or Customer can supply the materials too. Delivery & Packaging: As per requirements can be arranged. We provide CNC machining services with advanced equipments,skilled workers and quality control system, products showed here only present the capability of our business activities. Please send us the drawings or samples, we will offer our quotation to you soon. Machined Materials: Aluminum, Copper, Brass, Stainless Steel, Steel, Carbon Steel, Plastic,or as per the customers’ requirements. Equipment: Machining center, CNC, Lathe, Turning machine, Milling machine, Drilling machine, Internal and external grinding machine, grinding machine, Tapping drilling machine, Wire cutting machine, etc. Surface Treatment: Electra-polishing, Electrolysis nickel plating, Silver plating, Golden plating, Zinc plating, TIN plating, Chrome plating, Bead Blasting, Turning, Heat treatment, Black Anodize. Process Machines: CNC machine centers,CNC lathe,grinding machines,automatic lathe machines,Engine machines,welding machines,drilling machines,EDM,wire-cutting machines,tapping machines etc. Test Equipment: Square vernier caliper ,inside and outside micrometer ,steel tape, feeler gauge, depth micrometer gauge, radius gauge, thread pitch gauge, Coordinate measuring machine, projection machine, roughness tester, hardness tester, concentricity tester. The most advanced test equipment to ensure the quality. Color: Black, Silver, Red, Blue, Gold, Oliver, White and etc. Medical Equipment) House Hardwared) Toy Partse) Mechanical Equipment sf) Photographic Accessories) Motorcycle, Bicycle, Car Parts. h) Other customized Parts. Dimensions: According to customer’s drawing or Samples. Shipment Terms: As per customized specifications. Packing: Wooden box, or as per the customer’s requirements. We are proud to have recently announced the addition of a Machining Services division to the business in 2010. This division specialises in machining components from small one off jobs to large repeat orders. The range of products and components we are able to machine is virtually unlimited and includes flanges, adaptors, drive shafts, bulkhead fittings, gear housings, clevises, manifolds, pins, rods and brackets. Fast Turnaround: We operate on a rotational roster 6 days per week. 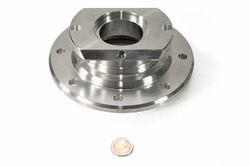 Cost Effective Solutions: We have innovative machining procedures ensuring efficiency and value for money. Range of materials: Including aluminium, bronze, brass, copper, plastic, duplex, stainless and mild steels. Our Engineering & Design team regularly perform stress analysis and apply design calculations using the latest FEA Software, ensuring our products will stand the test of time. We can also supply first article inspection reports when required. Advanced Machinery: We have range of machinery to provide a customisable machining solution to customers. We manufacture machined parts from carbon steel, stainless steel, aluminum and many other alloys, catering to architects, contractors, fabricators, assemblers, machinery builders and many other industries. Aluminum & MS parts (CNC Milling): We work with customers to help expedite their project with high quality and on time deliveries at competitive prices. We produce mill components with a high degree of consistency to close tolerances with no burrs. Surface finishes can be optical-quality grade as needed via plastic polishing. Complex components are easily manufactured through the machining capabilities of our milling machines. 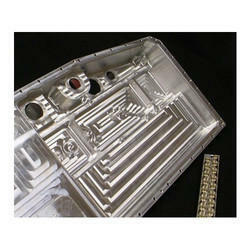 CNC plastic machining performs the task in a faster pace than the regular machining. 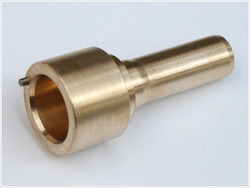 To get superior finishes and better clarity, CNC is used. 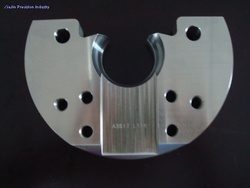 We also utilize software for CNC plastic machining and also improvise on our performance with other advance mechanisms. As we are focused on machining and fabrication, we understand the miniscule requirements and specialize in offering the best to our clients. Challenges excite us and we are always pleased to undertake projects that give us the opportunity to explore and create new solutions. We offer an in house machining service, with the capability of producing high quality engineered products to customer’s specifications. Our highly skilled machinists are experienced in all aspects of machining plastic. Whatever your machining requirements; one off's, prototypes, large or small runs, we are sure that we will have the experience, knowledge and capability to provide you with the service you require. We produce and offer custom and prototype Plastic Machined Parts service ranging from standard stock material to complex machining assignment. Since the beginning we have always put the needs of our customers first to meet each customer's requirement. The variety of our plastics parts and materials involves especially to those that are considered to be the most difficult to machine. Moreover, we expertly machine precision plastic components for a variety of customers suiting every industry including parts made for medical, electronics, instrumentation, industrial, and nuclear uses. Plastic machining offers an alternative to traditional steel, stainless steel and aluminium parts. We often work with our clients in maintaining Kanban stock levels for JUST IN TIME DELIVERY enabling shortened lead times and improved inventory efficiency and cost management. Plastic machined parts, machined by Dotmar, are used as replacements for OEM parts or as a newly developed part to improve machine performance. Plastic machined parts are lightweight and used where chemical resistance, electrical resistance, quietness or extreme wear resistance is required. Food, Bottle/Beverage and Transport as direct metal replacements for bearings, thrust washers, crane sheaves, pulleys and wear strips and conveyor curves. Precision Metal Works has been making metal stamping parts for more than 40 years. We are leading OEM manufacturers for Pharmaceutical machinery industry. 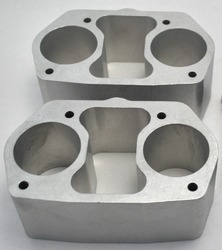 We undertake machining of wide variety of materials for unique and specific customer applications. Our machining methods and techniques are innovative, yet we maintain a standard of old world craftsmanship. Our artisan machinists use the latest CNC programming software and our proprietary machining processes have been developed and refined over the last 40 years. The end result is increased productivity and reduced machining times. Precision Metal Works offers a full range of 3 and 4 axis CNC machining centers, CNC lathes, and Inspection Equipment to ensure a high quality product which provides a wide range of capabilities to manage any specifications your project might require. A hydraulic manifold is a manifold that regulates fluid flow between pumps and actuators and other components in a hydraulic system. It is like a switchboard in an electrical circuit because it lets the operator control how much fluid flows between which components of a hydraulic machinery. For example, in a backhoe loader a manifold turns on or shuts off or diverts flow to the telescopic arms of the front bucket and the back bucket. The manifold is connected to the levers in the operator's cabin which the operator uses to achieve the desired manifold behaviour. A manifold is composed of assorted hydraulic valves connected to each other. It is the various combinations of states of these valves that allow complex control behaviour in a manifold. 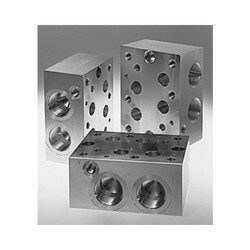 Steel, aluminum, cast or ductile iron manifold blocks. Anodized or zinc plating for protection in severe environments. Fittings, CETOP valves and accessory components can be included. "FastTrak" service for quick delivery of a working prototype. Looking for CNC Machined Parts ?